Lifeline system providing fall arrest / restraint protection when working at height. The KEELINE lifeline system provides fall arrest / restraint protection where guardrails are not suitable or where planning considerations require a virtually invisible fall protection solution. 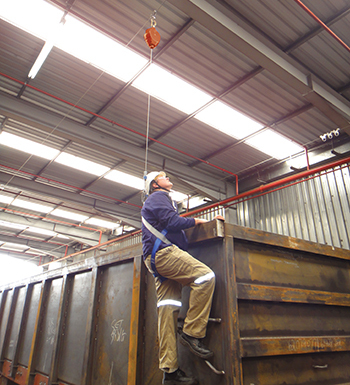 A wire based horizontal lifeline system offers a flexible, cost-effective solution for protecting workers at height. KEELINE provides complete and continual “handsfree” protection for up to three users when used as a fall arrest system. The KEELINE system has been tested and complies with EN 795:2012 requirements. Tesing in roof structure was witnessed by Decra. 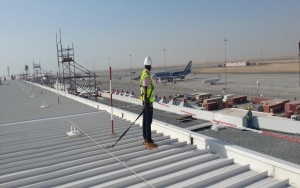 The KEELINE horizontal lifeline is designed to provide safe access to any area of a roof by allowing workers to be permanently attached to the line at all times and be able to freely move around the roof surface. The KEELINE system utilises 8mm grade 316 stainless steel wire and allows spans of up to 12m between posts. The system is designed so that the traveller which connects the user to the systems simply glides over brackets, overcoming the need to detach from the lifeline. 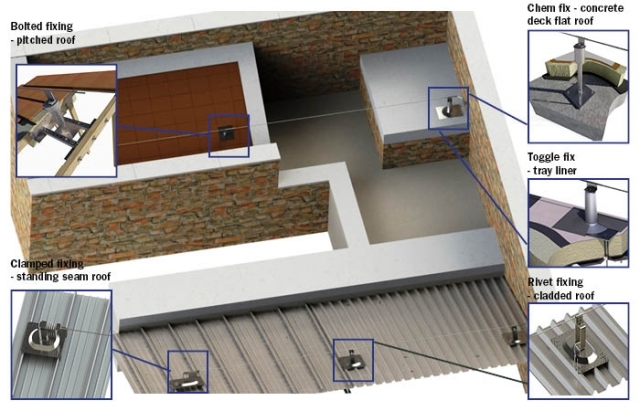 The KEELINE system has been tested and can be installed on a variety of roof types e.g. bitumen membrane roofs, standing seam and metal profile roofs using either "top fix" anchors or a "through fix" anchor (POSTANKA) where fixing to the meain building structure is preffered. 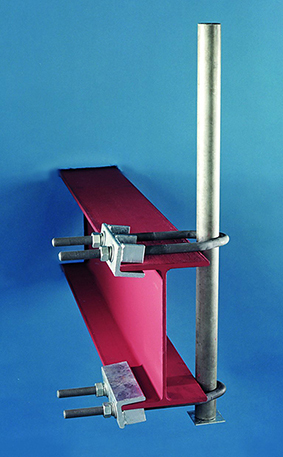 The KEELINE horizontal lifeline can be installed to any steel cladding panel, beam/column structure, solid parapet walls and flat roofs via a support post. When a life line system cannot be fixed through the roof’s structure, a free standing fall arrest / restraint system can be provided using our KEE ANCHOR roof anchors. A series of deadweight anchors can be linked at approximately 10m centres via the KEELINE horizontal restraint line. KEELINE is available for mounting directly to concrete, steel, brick and stonework in either horizontal or overhead applications. 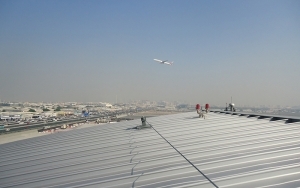 The KEELINE system is fully compliant with the requirements of EN 795:2012, CEN TS 16415:2013, ANSI Z359 and CSA Z259, and has undergone extensive testing in different roof types, with full third party approval. KEELINE has been tested to EN795 Class C Personal fall protection equipment – Anchor devices. The drawing below presents typical KEELINE system layout and fixing details, depending on a type of the roof. KEELINE Overhead provides personal fall protection, either fall arrest or restraint, for multiple users. 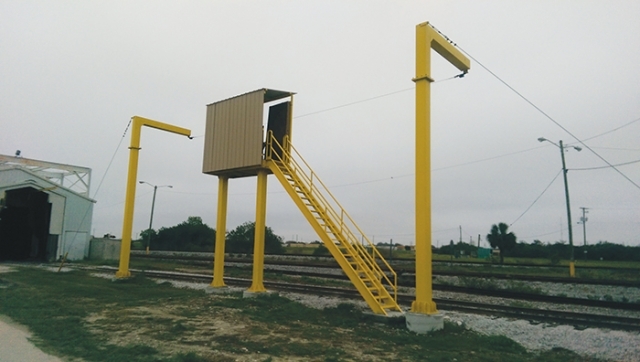 Used where it is beneficial to have the life line system mounted directly above the user including vehicle loading, machine maintenance and access, building maintenance and cleaning and overhead crane access. A KEELINE Overhead features a permanently attached two wheeled traveller which passes smoothly over the intermediate brackets, even when the user is attached to a fully extended inertia reel. The system can be configured to allow single or multiple spans of up to 24m in between supports and is designed with a higher pre-tension than the standard KEELINE system to reduce line sag and cable deflection. The system’s in-line shock absorber minimises the end loads back to the supporting structure.